Why Lakme Fashion Week Is Not Taking Any Action To Fake Lakme Australia Fashion Show? Lakme fashion week is one of the biggest fashion show for which people in the fashion world keep an eye out. It’s a dream come true for any designer to be a part of this show. From A-list designers to Bollywood showcase their trendy designs setting the mood with those ramp appearances. Recently we got to know about that this show is also going to happen in Australia by the name – Lakme Australia Fashion Show. When our team contacted organiser, lady who is organizing Lakme Australia Fashion Show , we come to know that it is a biggest fraud that this lady is doing in Australia. She is approaching new designers, models and makeup artists by saying that the directors of Lakme Fashion Week will come to Australia to be the part of this show. She is targeting the boutique owners to showcase their collection in the show charging $ 10,000 which is more then Milan Fashion Week fee. She is also charging the makeup artists and models a big amount of money to be the part of this show as a registration fee which is not authentic as it is always cleared that models have been payed by the designers/Organisers Instead of paying to the organisers to take part in the show.. She is also claming that she has bought five years right from Lakme team to use the name which is not true as Lakme team clearly said they have not waived any rights in favour of any person. They will take appropriate action in case of any trespass of der intellectual property. She Promised and promoted the event last year saying Malaika Arora will be coming but she Didn’t Come. But according to the news of NDTV Malaika canceled her tickets Because Of Non Payment also our source says she also come to know about this fraud Show .When people got to know about her cancelation they asked for their money back she is not even doing the same. She is just using the big names like Lakme brand Which is Associated With Reliance and Malaika Arora for making money. When someone once commented on social media how the show is connected with Lakme Fashion Week one of her associate replied that it has no connection with Lakme Fashion Week and later the comment was deleted. She is also Fooling people by saying Lakme Fashion Week People doesn’t use Lakme products and we are also doing the same just using the name of Lakme. When people come to know about this fraud they started reaching to the Lakme Fashion Week members but there is no response from the original Lakme Fashion Week members. They are also sending the screenshots of their conversation but still they are getting no response. Now people of Australia really concerned about and confused that whatever this lady is doing is really legal or not ? As she is using the big names such as Lakme and Reliance still there is no action from the legal team. And because of this the people are loosing trust and the authentication of the show is lost. 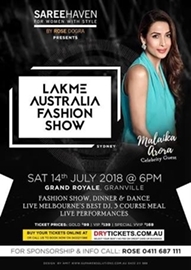 The lady has also done this show Sydney last year and this year she is doing in Melbourne and according to sources we are also hearing that this Lakme Fashion show is going to happen in Singapore , Dubai and Canada. If no action would be taken aggressively regarding this the Organiser will keep fooling people which is not good for the brand – Lakme Fashion! A strict action needs to be taken soon otherwise Lakme will lose the trust of the people!